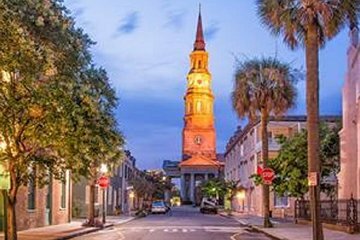 Discover the history and sights of Charleston on a 2-hour walking tour. Stroll past the High Battery Seawall, Charleston Harbor, Rainbow Row, the French Quarter, and the South of Broad district, taking in historic buildings and elegant mansions. You'll hear from the guide about the city's history and get great photo ops along the way. Choose from the morning or evening departure. Make your own way to the designated meeting point in Charleston to begin your walking tour with your guide. Follow your guide to the High Battery Seawall, see mansions along Charleston Harbor, and check out the colorful historic buildings on Rainbow Row. Learn about the architecture of the French Quarter's churches and theaters, and gain insight into the history of St. Michael's Church, which was built in 1750. Wind down your tour by walking past stately homes and the waterfront in the desirable South of Broad district. Expect to walk at a leisurely pace and get a comprehensive overview of Charleston. The tour is offered in the morning and evening.